DANNAR announced today it has signed a supply agreement with BMW i to provide BMW i3 batteries for the DANNAR Mobile Power Station®, the first-of-its-kind electric heavy-duty vehicle for infrastructure maintenance and disaster response. 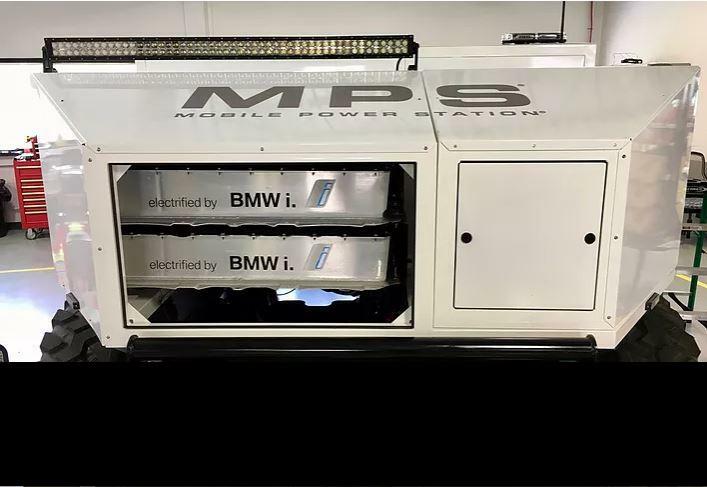 DANNAR is leading the conversion of advanced automotive battery technologies into off-road applications with the Mobile Power Station® (MPS®), which is purpose built to provide zero emission utility for cities, counties and states responsible for rebuilding a nation’s infrastructure. It can be outfitted with multiple seasonal configurations, making it not only more cost effective to operate, but also providing more work value than traditional diesel equipment such as tractors, skid steers and wheel loaders. The MPS can carry multiple BMW i3 battery packs on-board its steel ladder frame and 40,000 lb. rated axles. Custom configurations of multiple BMW batteries provide appropriate clean energy for single day or multiple day work requirements. Its two-way charger and inverter allows for emergency export power from the battery system for large buildings or neighborhoods. It is outfitted with a full Parker Hannifin hydraulic tool and attachment system and optional DANNAR work arms that can be outfitted with any CAT® or Bobcat® attachments. The high-voltage batteries used in the BMW i3 feature eight modules, each containing 12 cells and were developed in-house by the BMW Group. The packs are currently delivered to DANNAR’s Indiana assembly facility from BMW’s plant in Dingolfing, Germany. BMW i and DANNAR have been working together on development of the MPS with i3 batteries for over a year. DANNAR also has partnerships in place with other tier one suppliers, including Parker Hannifin (mobile hydraulic system), UQM Technologies (HD950T traction motor) and Cummins (optional tier 4 generator).